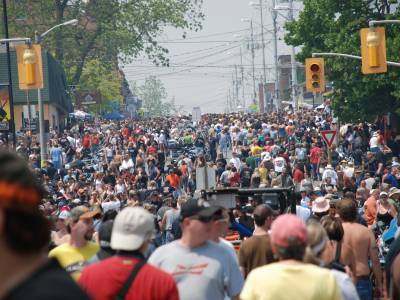 Friday the thirteenth in Port Dover . Had NO interest in going this year but a good friend wanted a riding companion so I went. It was not a classic ride. 407 to Burlington and 403/6 the rest of the way. But it was great ride. My MP3 player was serving up great tunes all the way there, it was sunny and warm and the highway was empty most of the way. My friend was riding very well with me and I never had to worry about where she was. The OPP were out in force but we had no problems . Somewhere in Oakville I had a bit of an Epiphany . I was looking at a Field of yellow flowers and it dawned on me that i have a great life. Yes people I love have cancer and I was just dumped and it hurts. But I had 3 three great months with a great woman already this year and I've had lots of great moments over the last two years with a couple of others. Some people never get that . I've felt as though I've touched some souls. And definitely felt loved . Nothing in life can compare and I am so lucky to have had that. After a bleak period I am looking forward to more relationship adventures . It may turn out as bad but I think I can handle it now knowing that the pain is worth the connection. And it is. As for Dover? Same old thing . Cruiser after Cruiser after Cruiser with a scattering of scooters and real motorcycles . :) Sportbikes in other words! I bought a t-shirt ( NO Skulls,No Knives,No Choppers It has a spark plug. Ftting for a guy with the Nickname Tinker) I saw a few friends and we left at lunch time getting home before the rain. A very good day . Test Comment. I do have to say that that is quite the AWESOME post though!